This post is part three in a series of four. If you haven't started from the beginning, please click here. I am the queen of drawing my birthday out over weeks and even months. Every year, I start talking about it months in advance. I make plans and ensure there are several different celebrations. I even had seven cakes one year! This year was no exception. While I only had one cake, I did start planning early and continued celebrating well after the big day. Last weekend, I headed up to the KC/Lawrence area so my pals up there could celebrate my birthday. The peak of the weekend was the Tool concert. 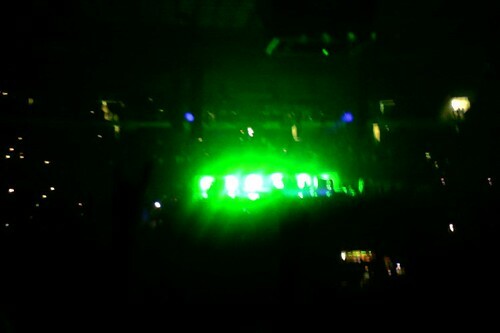 Tool was the first concert I had ever been to without my parents. It was awesome and nothing has ever really compared. This time around, it seemed like maybe both the band and I had matured. I wasn't on the floor, so I wasn't risking my bones by shoving my way to the front. Maynard wasn't wearing a mask. He did pull out a cowboy hat, though . . .
After the show, Marcus, Raw, Casey and I headed to Westport to meet my cousin, Allison and her friends. In honor of my birthday, my brother drank Black Russians with me. Since I was sitting at the bar, I became the official "drink orderer" for my crew. I was doing pretty well until Allison came up and asked me to get her a gin and Diet Coke. "Gin and Diet Coke???" I wailed. "GROSS!!! I mean, gin and juice or maybe gin and tonic but Diet Coke???" "I don't like regular Coke." "Okay," I tried to reason. "That's fine. But who mixes gin with cola???" She shrugged and I told the bartender what she wanted. His face screwed up and I held up my hands as if to say "Hey I tried to tell her she was crazy!" Allison turned to see him pouring the drink and shouted "No no no! JIM and Diet Coke!"